Our next Grand Prix event will be the 5-kilometer Eastern Regional Masters Championship, to be held Sunday, Aug. 12, at Springfield College in Springfield, MA. The race is part of the regional masters track and field championships and is open to all competitors age 30 or older, which is most of us. Starting time is 10:40 a.m.; the women's race goes first. We've had good participation in this event the past two years and are looking for another strong turnout this time. Entry forms are available at the USATF-NE web site. Click here for an entry. For further information, call the New England track and field office at 617-566-7600. Hats off to the New England Walkers members and friends who assisted at the JP Morgan Chase Corporate Challenge road race in Boston on June 21. In addition to helping the race run smoothly, these volunteers earned vital funds for our club treasury: Thomas Knatt, Richard Ruquist, Harold Thornley, Michael LaRocca, Bill Harriman, Roger Robinson, Ralph Robinson, Sasha Volgin, Tyler Shelby, Rick Moore, Maureen Danahy, Steve Vaitones, Yuri Kuo, Genya Kuo, Bob Falciola, Justin Kuo. Bay State Games 3K - July 14, Dedham, MA. The opening event, and probably the one with the oldest field, in the track portion of the annual Massachusetts summer sports festival. Steve presumably holds some sort of longevity record here, having won his first gold medal in the games about two decades ago. 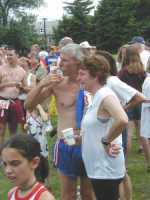 Town of Dedham 5-miler -- July 4, Dedham, MA. A holiday tradition. Tough course, hot sun, no judges, and we start amidst 340 runners. But it's a great kickoff for the Fourth of July, with competitors and support troops all in high spirits. New England outdoor 3K championship, almost - June 16, Dedham, MA. Perhaps it was the humid 92-degree weather. Maybe it was the fact that our 20K had come only six days earlier. Perhaps everyone just had something else to do. Whatever the reason, this normally well-attended event, part of the regional track and field championships, drew a field of ... just me. "Do you really want me to do this?" I asked meet director Steve Vaitones and his lieutenants as the moment drew near. "I don't want to waste everyone's time." Steve said I should indeed race; I had entered and the period for the racewalk had been scheduled. Then he thought a moment and added, "How about if you race a mile? Then people won't say 'Him again?'" for seven and a half times around the track. It was a deal. With full formality (or nearly so; we did dispense with the hip number), I took to the line, the starter fired his pistol, and off I went. Halfway around, I received a long ripple of applause from the athletes and coaches waiting for their events to begin. When I entered the final straightaway of the first lap, I looked at the clock and realized that, in an effort to impress my new fans, I had gone out at a pace that I never could have sustained in my best days of yore, let alone now. I abruptly shifted into a more manageable gear. Three more laps, many more words of encouragement, and I was done (in 9:30, for the record). The competitive races could resume. I left the premises without asking for a first-place prize. "There's a glass awaiting you," Steve said. "Ninety percent of life is showing up." I said I would settle for an unofficial designation as good sport of the day. New England 20-kilometer championship -- Charlestown, RI, June 10. A turnout in double figures for the second straight year at Ninigret Park. A full field did not materialize this time for a preliminary 5K, but race director Joe Light and judge Tom Knatt went the distance informally, to great applause. The course on the abandoned runway was not only perfectly flat but also perfectly shadeless, leaving us at the mercy of the relentless warm sunshine. "No one is going to set any records today," Bob Keating predicted beforehand, and, indeed, several of us wound up with personal worsts. But this was nonetheless one of our top events of the year, with great support from the judges and a spirited group of helpers. Judges: Bob Ullman and Joanne Harriman. Judges: Carol Kuo, Joanne and Bill Harriman, Charlie Mansbach. Judges: Joanne and Bill Harriman. We can divide our world into three categories: Those who try racewalking and become hooked for life; those who take it up but don't stick with it; and those who would never think of trying it in the first place. Ken Mattsson fits squarely into the first group, and he has spent much of the past decade trying to reach out to people in the other two categories. In an interview last month, Ken talked about his efforts and the conclusions he has drawn from them. How did you become interested in racewalking? I started around 1989. I tried running and was really really bad, largely because of joint problems. I'd always gone for walks. Then I started timing myself and tried walking faster. I remembered seeing racewalking on television long ago, on a little clip from the Olympics, so I knew such a thing existed. So I started looking for information. I saw listings for the New England Walkers and the North Medford Club. I mailed in a membership to the New England Walkers and finally got a newsletter, but it didn't say anything about how to meet people, how to learn, where to go. I called Phil McGaw at North Medford, and he invited me to Fresh Pond in Cambridge. I worked out with him there every Wednesday for a year, commuting from Marlborough. He was really helpful. After you began racing, what made you want to participate in a broader way? As I've said to people, I'm sure that in a past life, I was a border collie. What I do is I organize people whenever I have an interest in something. So I tried to see how to get people involved. It's a natural thing with me. The first thing I came up with was the Racewalking Grand Prix. I organized that, tried to get more people active. Then around 1992, Ed O'Connor of Connecticut wrote a letter in Oho Racewalker asking if anyone had e-mail and wanted to talk about racewalking on the Internet. We developed that idea. We now have 500 people subscribing. I've been in charge of the list ever since the beginning. I was also one of the people who started the Danehy Park series. Mostly, I just look for the opportunities for people to get together, walk and talk, and to have a consistent area they they can count on to ground their training and goals. How did organizing lead you into coaching? A group of us used to work out consistently at the MIT track. Having that group there helped to provide an anchor -- if people are interested and know that something is happening weekly, they know that sooner or later they'll get there. We'd get new people, and Justin Kuo and I would start helping them out. Justin would also arrange for Tom Knatt to give clinics for beginners. One time Tom wasn't available to do a formal clinic, so Justin asked me. I did it and liked it. I could see that people were getting something from it, and I was able to contribute something because of my background in teaching, After that, individuals would ask me for help. But individual lessons would take a lot of my time, so five or six years ago, I started doing Introductory Racewalking clinics, for 2 - 2 1/2 hours. What led you to represent groups beyond the New England Walkers? Around winter 1996, I was doing weekly sessions on the indoor track. I charged a nominal fee. We had about 20 people. Then we moved outdoors, and they kept coming. Around then I was approached by the Leukemia Society, which was developing its marathon program. I became what they called a "paid volunteer," building the program, learning how to motivate people. It was endurance walking more than racewalking, but I was teaching them the same efficient techniques. It was taking all of my Saturdays. But with all this activity, I was getting a core of people. The group I was having at the track would go to races and didn't feel part of the group they'd see there. They felt they were their own group. As I didn't really want to start a completely separate club, and wanted to tie in more with the world of running, I contacted the Cambridge Sports Union, which had an organization in place, about adding a racewalking component. We've been working out there for the past three years. We have had an introductory clinic once a month, free with membership in the club. What have you found will spur people's involvement? People have to see that there is consistency behind what we're doing. They should know about the events, see listings consistently, know things are going on, know we're still here. We're always going to be a minority; we have to nurture the small, committed communities. It takes a lot of effort. If we can just do a few things well and consistently, and let people know about them, we'll be doing much better. Too many times it seems that we're our own little party that others don't know they were invited to. There are a lot of great people in the racewalking community here in New England who have done a tremendous amount of work over the years, but we get burned out easily, too. I think it's happened to all of us. What should the rest of us be doing? We need to coordinate. We have to think small and quality. Just like the program in Maine. Most of the Olympians for the next 20 years are going to come out of Maine because of Tom Eastler's efforts up there. Granted, most of us don't have the drive, enthusiasm, and tenacity of Tom, but if we can have a focus here and coordinate, we'll be doing much better. If people are interested and can contact us, we can tell them where there are clinics, where there are events etc. We need to have those hooks out there. If we're a consistent community, it will grow. On the same theme of how best to develop interest in our sport, following is a copy of an e-mail that Tom Knatt sent to racewalking organizers Sal and Marjorie Corrallo last month. Tom welcomes all feedback. I am following up on the topics discussed at the Richmond meeting on Sunday morning. The main item for me was to have the USATF promulgate packets of information about racewalking which would give an air of authenticity to the sport. One would be given to prospective new racewalkers outlining rules and basic training techniques. Ron Laird's stick figures come to mind. Also, websites, books, a list of clubs, availability of races, an invitation to join the USATF, should be included. All items should be allowed to be reproduced. Another would contain promotional info. for people like Frank Fina, race directors, club presidents, and to present to the media and to private companies to help promote the sport. Emphasis for companies should be on tax-deductibility, community involvement in an Olympic sport, bolstering the company image, and fostering business by attracting new customers from the racewalking community. For the media, specific suggestions on how to contact newspapers, TV including local cable, radio etc. would be good. An actual checklist would help. In both packets, an easy to read history of racewalking would spark interest. Another packet could be directed toward coaches (reluctant or otherwise) addressing their concerns about coaching and judging the sport. Another packet could be for topflight athletes outlining opportunities, so that they might be attracted to the sport. I will stop myself here so as to not get too carried away. The main point is that, with several/many sheets of paper covering the different topics, a pocket folder or manila envelope can form a packet which can be tailored to various audiences. If clubs, coaches, parents of athletes etc. are allowed to reproduce the material, the only cost to the USATF is the initial production, which could probably be done largely by volunteer efforts. Do we need this? I am reminded that in 1968, when I started, it took me six months or more to find out the definition of racewalking at that time. I'll wager that there are a lot of coaches and athletes not in the sport today who cannot give today's definition. The first thing to do to gain recognition and interest for racewalking is outreach. I think what I have outlined would be part of that. Ken Mattsson is scheduling racewalking sessions at 6:30 p.m. on Tuesdays at the Harvard University track in Cambridge, MA in conjunction with the Cambridge Sports Union. Dave Sullivan of the Athletics East track club is looking to add racewalkers to his stable of competitors. Those interested in competing for Athletics East in New England track and field championships would not need to give up their New England Walkers memberships, Sullivan says. Walkers would be given Athletics East uniforms and would have their membership fees waived. Those interested can call Sullivan at 781-246-2563 or visit the www.athleticseast.com Web site. 5 -5K, Danehy Park, Cambridge, 9:30 a.m. Moved up from the second Sunday of the month so as not to conflict with the regional 5K. Contact Bill Harriman at 978-640-9676 (before 9:30 p.m.). 12 - Eastern Regional Masters 5K championship. Part of the regional masters track and field meet. Grand Prix event. Springfield College, Springfield, MA. New England track and field office, 617-566-7600. Click here for an entry form. 26 - Brookline Reservoir walk. 617-731-9889. 26 - Sherwood Foundation 10K. Unjudged walk in conjunction with running race. 401-943-1123. 23 - Brookline Reservoir walk. 617-731-9889. 7 -- National One- and Two-Hour Championships, Worcester Polytechnic Institute, Worcester, MA. Grand Prix event. Justin Kuo, 617-731-9889. 14 - Sherwood Foundation 5K, 9 a.m., Providence, RI. 401-943-1123. August 1985 - Bob Keating outduels Tom Knatt, 22:51 to 27:17, on a sun-baked track in Waltham, MA, for the New England 5K outdoor championship. Only four of us turn up for the race, while a preliminary 3K draws 10 competitors. June 1995 - This is more like it: Twenty walkers take to an equally sun-baked track at Worcester Polytechnic Institute for the New England 5K. Brian Savilonis wins the men's title in 24:19; Lynda DeWitt is top woman in 27:19. This page was last updated July 22, 2001.